I have had a few days off last week but as often happens I didn't do any scrapping on my days off... instead I rush to get the UKScrappers weekly and monthly challenges done in the evening and then find I can't photograph my layouts (LO) as there is no light! 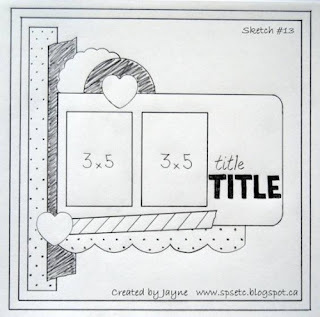 This weeks challenge was to make a LO using buttons, ribbon, stamping and this sketch. I turned the sketch on it's side. I'm not 100% happy with the way this LO turned out.. i think it's the buttons and pearls but the photos are from the first meal my husband and I had when we arrived in Maui on our honeymoon, it was a lovely steak meal at the Black Rock Grill at the Sheraton Maui. The papers are Summer's End by Fancy pants. I've also had a stab at this months house challenge which was to use a specific colour pallet of Iris Blu, leaf green, orange and yellow. The photo is of my mum on our summer holiday to Turkey this year. The papers are an old my minds eye collection. I want to add some journalling to this LO but need to think a little more about what to write... it was a truly wonderful holiday but the events since have made it hard to scrap this holiday.. i'm not sure whether I want to write my journalling from my current perspective or as I felt at the time. I have left this LO to one side while I think this over.